Few things can ruin a day faster than an unexpected car crisis. You’re driving to work, on your way to dinner with friends or taking the kids to soccer practice when something on your dashboard catches your eye: a warning light. It might appear as a glowing orange engine symbol, or as bold, intimidating type: CHECK ENGINE. It is one of the most dreadful sights an unsuspecting driver can experience. Your heart sinks while unimaginable possibilities rush through your mind: What does this mean? Do I need a new engine? How much would that cost? Maybe it’s time for a new car? Why me? Relax and take a deep breath. When this particular warning light appears, don’t panic. And no, don’t start shopping for a new car just yet. 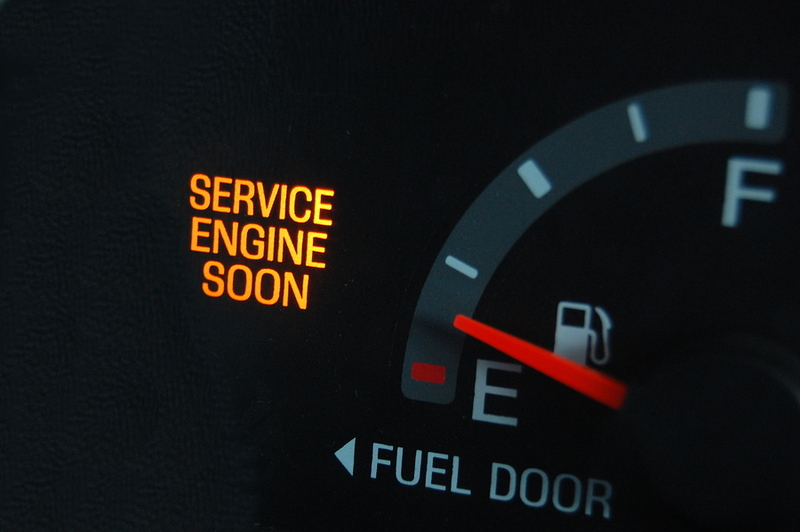 Let’s walk through what the CHECK ENGINE light means and what you need to do about it. While yes, the CHECK ENGINE light is an indication of an issue related to your car’s engine (apparently one of its most essential components), alerting you to the fact that something is not operating as it was designed to, it is often not as bad as that ominous warning might indicate. The CHECK ENGINE Light is a component of the car’s On-Board Diagnostic (OBD) system, which is part of the car’s brain or computer, which monitors all critical systems for proper functioning. 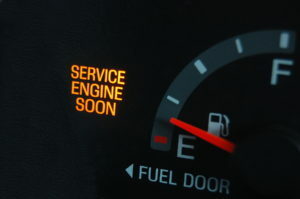 When one of the many sensors within the system detects a fault, it records the data as a code in the computer and activates the appropriate warning device: in this case the CHECK ENGINE light on the dashboard. And no, it does not mean that your car’s engine is going to blow up or drop onto the road, leaving you stranded. This warning is rarely the result of a mechanical problem, something breaking, but rather a heads-up regarding your car’s fuel and emission systems. Your car’s engine takes in air and gas and ignites this pressurized mixture with a spark from your spark plugs, causing internal combustion or explosion within the engine cylinders, causing the engine to run. The constant cycling of this process is what drives the motor, and thus the car. After each small explosion, the fumes from the combustion are exited through the exhaust system. The precise control of this fuel/gas mixture and process, along with the components of the system, which include things like the mass airflow system (MAS), oxygen sensors, catalytic converter(s) and even your gas cap, can affect not only the performance of the engine, but more specifically in this case, the quality of the exhaust fumes that exit your car. And that is what the CHECK ENGINE light is warning of—the potential for excessive emissions and harmful toxins—beyond safe levels determined by your car’s computer system (and governed by the Environmental Protection Agency), spewing out into the environment. And it’s important to note that in states or regions that require an emissions inspection, your car will most likely not pass with the CHECK ENGINE light on. So, what do you do? A good rule of thumb for any “unusual” car activity or warning is to pull over to a safe location, away from traffic, turn the car off and do a quick assessment or walk around. Check for smoke, unusual smells or dripping fluids. Then, if you see nothing out of the ordinary, aside from that annoying CHECK ENGINE light, it is probably okay to continue driving, as long as the car is performing safely. Then, since as we know, most car problems don’t fix themselves, and can quickly turn into more significant and costly repairs, it is highly advisable to get the car to a qualified shop as soon as possible. Reputable service shops that perform Auto Engine Repair and most that do exhaust and brake service have the necessary tools to read the CHECK ENGINE fault code, provide a report showing where the error occurred, diagnose the problem and provide the necessary repairs. So, even though the CHECK ENGINE light might not indicate a terminal problem, don’t ignore it, because left as is, the problem will most likely get worse. And instead of something as simple as a faulty gas cap or a worn-out oxygen sensor, your problems could quickly escalate into a much more severe and costly repair, such as replacing catalytic converters. For more information or to receive a free price quote, contact Hollenshade’s Auto Repair Service today!